A stakeholders meeting for the final discussion on views so far collated on President Nana Addo Dankwa Akufo- Addo directive for 30 per cent of the 70 per cent local content in procurement to be given to women, youth and persons with disability, on Monday took place in Accra. As a prelude to the meeting, the Ministry of Public Sector Procurement had solicited inputs from various stakeholders and made mass media announcements inviting inputs of the general public, which have been put together for the discussions. Ms Safo stated that the objectives of the new policy are to ensure inclusiveness, bring reforms in state procurement, address resistance and to build capacities. According to the Minister, the President's mantra of 'Ghana beyond Aid' would actualize if 'we adopt and implement the right policies and take the necessary decisions,' adding that, the Ministry of Public Sector Procurement exists to play an advisory role to the President on matters on public procurement. It is also to formulate policies, based on the President's vision. The Minister bemoaned the wanton abuse of sole sourcing and restrictive tendering as a method of procurement, and informed the meeting of the Ministry's visits to some of the high spending state agencies and institutions to learn of how they went about their procurement activities, following which the Ministry gave advice on achieving transparency, efficiency and value for money in their procurements. 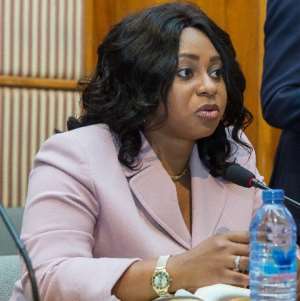 She said to avoid litigations with the Government for claims of judgment debts, the Ministry last year sent a written caveat to all Ministries, Departments and Agencies to stop the abrogation of contracts and refer all such matters to her office for advice. Ms Safo, who is also the Deputy Majority Leader in Parliament; and MP for Dome Kwabenya, said the issue of shoddy jobs and unnecessary delay of government contracts have now become a major canker in the development agenda of the state. 'Government spends huge sums of money awarding contracts hoping to achieve value for money for projects when they are completed, but rather sadly, the state in most cases is slapped with shoddy works and in a twinkle of an eye those heavily invested project suffer the torrents of collapse and deterioration,' the Minister said. She announced that her office is in the process of developing a database for contractors, consultants and suppliers, who bid for government contracts and also develop a software that will assess the performance of all such contractors, and those who appear to meet the performance criterion will be motivated with more contracts. 'Those who fail will be blacklisted,' the Minister warned.